Our exclusive waterfront setting, just minutes from downtown Toronto, provides an exceptional opportunity for corporate retreats, think-tanks or meetings of any kind relative to your business. Our Flag Room can accommodate groups of 10 to 30 people with a breath taking patio that leads to our well manicured grounds. Informal meetings for up to 100 people can be held in our main lounge with a wrap around patio with unobstructed views of the city lights and Lake Ontario. Spring and fall are ideal times of the year to host a meeting with us. Packages will be customized to suit your needs. And if you're about to tie the knot, Mimico Cruising Club offers an incomparable and intimate setting, with exquisite cuisine. 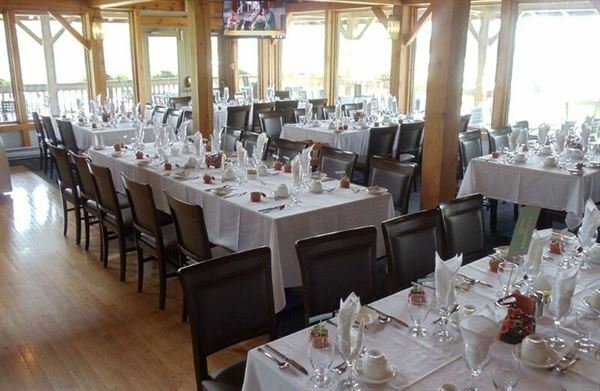 We can host wedding receptions for up to 110 people. Please contact the General Manager, John Pereira for more information. Menus: Menu selections are required 30 days prior to your event. Pricing: Food and Beverage prices are subject to change without notice. Final pricing will be confirmed 60 days prior to your function. Tax and Service Charge: All menu, beverage and room prices are subject to applicable sales taxes of 13% HST & 15% service charge will be added to the final billing. Guarantee: All details must be arranged 30 days prior to your event. A guaranteed number of people in attendance must be received 7 days prior to your event. This guaranteed number is not subject to reduction. Food and Beverage: Due to licensing restrictions, all beverages must be provided by Mimico Cruising Club. The removal of any food or beverage from the premises is prohibited. Deposits and Payment: Time Period Amount Due Upon the acceptance of the contract 25% of the estimated food, beverage & rental values Six months prior to the event 25% One month prior to the event 25% Two weeks prior to the event 25% The day of the event Balance All scheduled payments are non-refundable. Payment methods are cash, certified cheque, money order, Interac, and credit card (VISA, MC). Liability and Damage: Mimico Cruising Club will not be responsible for the damage or loss of equipment or merchandise stored or displayed on its property prior to, during or following your event. Mimico Cruising Club reserves the right to assess charges for damages incurred due to the misuse or abuse of equipment and or facilities during your reception. Security: We reserve the right to require security arrangements for any event. Applicable charges will be the sole responsibility of the host. Mimico Cruising Club reserves the right to inspect and control all private events. Cancellations: Should you cancel your event, no amount of the deposit will be refunded. Bar Requirements: Mimico Cruising Club, as a Licensee, is responsible for the administration of the sale and service of alcoholic beverages in accordance with LLBO laws. Our alcoholic beverages license requires that we (1) request valid identification of any person of questionable age and refuse alcoholic beverage service if the person is either underage or if valid identification cannot be produced and (2) refuse alcoholic beverage service to any person who in our judgment appears to be impaired. Entertainment: You may hire your own band or D.J. All Equipment to provide entertainment and music must be provided by the D.J. or Band. If special setup is required, they must make arrangements with us at least one week prior to the event. Decorations: Tables may be covered with a white linen cloth and a linen napkin. The use of confetti is prohibited. You may bring in your own decorations, subject to our approval. All decorations must be removed 8 hours after the event. The venue is lovely. It has a rustic, warm and cozy atmosphere that was perfect for a gathering. Beautiful view of the Mimico boat Harbor, the roaring Fire place and the gorgeous christmas decor really made us all feel happy and pampered. Food and the service was excellent. I highly recommend this venue for your corporate and private gatherings.